Prof. Sanjay Reddy has a Ph.D. in economics and a M.Phil. in social anthropolgy. 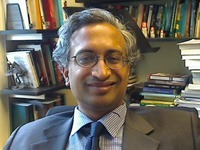 He is currently Associate Professor of Economics and Co-director of the India-China Institute at The New School for Social Research. Prof. Marcellus Andrews has a Ph.D. in economics. He currently teaches economics at Bucknell University and is a member of the New Economics Institute. He was a previous panelist on a TRACT event: Financial Crisis – Humanity Crisis? Ms. Cheyenna Weber recently completed her term as Director of Coalition Organizing & Campaigns at the New Economics Institute. 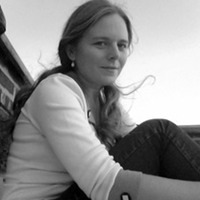 She is an experienced activist who has translated new economy principles into practice through a local organization she co-founded, SolidarityNYC. Prof. Michael Blim has a Ph.D. in anthropolgy. He is currently Professor of Anthropology at the Graduate Center at the City University of New York. He is the author most recently of Equality and Economy: The Global Challenge. In September of 2013, five years will have passed after the largest economic crisis in the United States since the Great Depression. Yet veteran experts and mainstream economists seem content remaining within familiar limitations – austerity, neo-Keynesianism, re-regulation, and well-worn variants of the state v. market debate. What is necessary now, in this post-crisis period that has turned into a ‘great stagnation’, is a fundamental rethink of how humans across the globe organize the economy. A new economic imagination is imperative. Alternatives to government intervention and unfettered financial markets – cooperatives, local trading systems, alternative currencies, to name a few – have always existed but few moments have offered them such a stage as the present post-crisis impasse. The silver lining of financial crises, if there is one, is that it foments frustration with existing models and experimentation with new forms of economic organization. Spaces are created for heterodox thinking and policy. We hope to contribute to the expansion of such spaces. -Why have existing paradigms and institutions been unable to deal with the crisis? Are we in a fundamentally new era (e.g. extreme fiscal imbalance) where policy tools of the past may not be applicable? Are comparisons to the Great Depression apropos? 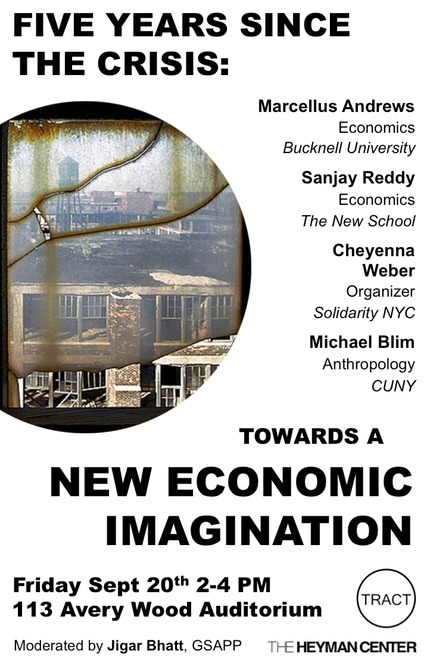 -What conceptual changes, or ‘paradigm shifts’, are necessary for a new economic imagination? Has the role of neo-classical economics in the financial crisis been overstated or understated? -Are New Economy approaches really new? If so, what is new about them? If not, what are the conditions that allow for them to pass as ‘new’? -What are some of the promises and pitfalls of existing models in the ‘New Economy’ movement? Are the new economy’s localized and micro-based approaches a distinct advantage? Do they have the potential to transform economic production and exchange? Are they too focused on post-industrialized contexts? -In a utopian sense, what would ideal models of economic organization look like? Click here for directions to Avery Hall.